Each week, Voice of Bulls Football Paul Peck will preview the upcoming game. The great philosopher Ric Flair once said: “To be the man, you’ve got to beat the man.” That quote seems to fit this week’s UB-Toledo game, one of the biggest regular season games in school history. The Rockets are the man, the defending MAC Champions. Beyond that, they have been the class of the conference for a long time. UT has won nine games or more in six of the last seven years. Even when they don’t win the MAC West or championship, they are always the most talented team with the most NFL prospects. The 2013 MAC East title game at Ralph Wilson Stadium against Bowling Green…and the 2008 BG game that clinched the MAC East Title…may be the biggest regular season games in school history. But to me, this one is up there. It’s a chance to show the world that this UB team is for real. I can’t wait. 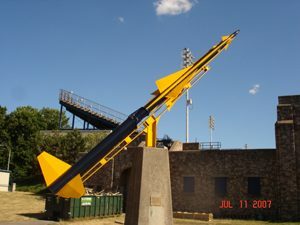 Bull Session Trivia: This actual 1950’s era Nike-Ajax missile is mounted just outside the wall of Toledo’s Glass Bowl. It is painted in the school’s colors. Legend says it is actually pointed at a real location on the campus of Toledo’s main rival. Can you guess where it would land? Maybe he was inspired by wearing a running back’s number 41, but Tyree Jackson stretched his legs for the first time against Akron. In the first six games, he ran by design only once. Last Saturday, he did it seven times for 57 yards. Head Coach Lance Leipold says he has never told Tyree to run, or not run. He leaves it up to his quarterback. Tyree saw opportunities to get first downs, and was smart about when and how he ran. He actually slid once, the first time anyone at UB has ever seen that happen. Maybe that slide was inspired by Leipold’s cheering of his Milwaukee Brewers, as they make a run to the World Series…Once again, some of Tyree’s best throws came on the run. Especially the long throw to K.J. Osborn. Even when the pocket collapses, the play is never dead. That’s frustrating for a defense, and a huge tool for the UB offense…Getting Anthony Johnson back also opened up the UB offense. Even though he had only two catches, getting AJ out there for more than half of the Bulls plays (39 of 76) was a huge boost, and Akron’s defense had to react…It allowed Osborn to continue his magical season. The 116 yards receiving was his second 100-yard game of the year. He’s currently 4th in the MAC in receiving yards, and 14th in the NCAA in TD catches. Even Johnson, after basically missing two-and-a-half game, is 9th in the MAC in receiving yards…The Bulls converted 8/14 third downs, and they’re fourth in the MAC in that important statistic…Some may be wondering why Dominic Johnson has been the second QB in the games. Johnson has been improving, and is now listed on the team’s official depth chart as the backup. Plus, the team is trying to protect Kyle Vantrease’s opportunity to redshirt after he played three games as a freshman last year…Bulls center James O’Hagan, who hasn’t allowed a sack since his freshman year, was named to a pair of midseason All-American teams. He made USA Today’s second team, and Pro Football Focus’ honorable mention list…With starting guard Paul Nosworthy injured, Trey Derouen started and played most of the game at left guard. He helped the Bulls run for 223 yards…There was another Bo Oliver-like moment for Jaret Patterson. Two actually. His touchdown run, and a run where he kept the pile moving for another five yards, were vintage Oliver moments. Bo must be proud of the player he calls his “lil bro”…Toledo’s defense ranks 8th or worse in nearly every major MAC category. They allow 35 points per game, and they’ve given up more than 30 points in four of their six games. Teams have had success throwing on the Rockets…The Toledo defensive line is strong. DT Reggie Howard is very good, and DE Tuzar Skipper leads the team in sacks…It’s a veteran secondary, with three starters entering their third seasons as starters. Safety Kahlil Robinson is the team’s leading tackler…In last week’s loss to Eastern Michigan, the Rockets gave up 28 first half points but kept the Eagles scoreless in the second half. Bullet Points: 9. That’s how many interceptions the Bulls have this season. That leads the MAC and ranks 10th in the country. Last year, the Bulls had 8 the entire season. The amazing defensive effort against Akron was the first game in five years where the UB defense did not allow a touchdown. The Zips didn’t get to the red zone, never even advancing past the 27-yard line. Akron was only 3/14 on third down…Two of the three sacks came from Taylor Riggins. The backup defensive end saw extensive playing time when Chuck Harris was knocked from the game. “He’s a good football player, he’s assignment sound, he does things the way you want him to. He’s detail oriented. You need guys like that on your team,” says Leipold…The other sack belonged to Myles Nicholas, which gives him two sacks in the last two games…Khalil Hodge’s 12 tackles earned him MAC East Defensive Player of the Week honors for the third time his season. Only Khalil Mack, the “other” Khalil, has done that. Hodge is now 5th on UB’s all-time tackle list…Fellow linebacker Jordan Collier had a big game. Along with his first career interception, Collier had 1.5 tackles for loss…The Bulls are averaging six tackles for loss per game…More depth on defense was displayed in the Akron win. Along with Riggins, defensive backs Tyrone Hill and Roy Baker played extensively and made big plays…The big effort from the D moved the Bulls into the #1 ranking in the MAC. They lead in fewest yards and points allowed, and rank second in fewest passing yards allowed…The unit will get a big test this week. Toledo leads the MAC in points, averaging 43 per game. They have scored more than 50 in a game three times…For the third straight week, the Bulls will have to stop a running quarterback. But the Rocket’s Mitchell Guadagni is the best of the three. He’s second in the MAC in rushing, averaging 77 yards per game. Add in his #1 ranking in pass efficiency, and Guadagni may be the most versatile QB the Bulls have faced. He’s coming off a 28 carry, 134 yard rushing game against EMU. He also threw a pretty TD pass their big second half comeback…Look for the Bulls to utilize what has worked in slowing down QB’s the last two weeks: Hodge acting as a spy, and the defensive lineman controlling their rush to not allow big running lanes…When Guadagni throws, he has the deepest receiving corp in the conference. Cody Thompson, Diontae Johnson and Jon’Vea Johnson have all been All-MAC. They’ve combined for 66 career touchdowns…Thompson’s 2952 career receiving yards make him the NCAA’s active leader. He missed nearly all of last season, but has caught a ball in 36 straight games…Diontae Johnson had 13 touchdowns last season, just behind Anthony Johnson for the MAC lead…Jon’Vea Johnson is averaging almost 21 yard per catch this season…While Guadagni is the main rusher, Toledo uses three running backs in their rotation. Shakif Seymour leads in carries, followed closely by Bryant Koback, a Kentucky transfer…Part of Toledo’s offense is kicker Jameson Vest. One of the MAC’s best, he leads the conference in scoring. The Bulls special teams coverage units have been good this year, but they’ll be tested by Toledo. UB hasn’t given up kick or punt return longer than 33 yards. Players like Matt Otwinowski, Joey Banks, Jovany Ruiz and Theo Anderson have spearheaded the coverage units. So has Adam Mitcheson, who’s 25 touchbacks (second in MAC) don’t require any coverage. But Diontae Johnson will be their biggest challenge of the year, on kickoffs and punts. He averages 32 yards on kicks, 18 yards on punts. He’s got one kickoff return touchdown, and three punt returns of more than 40 yards. Kicker Mitcheson and punter Evan Finegan (3rd in MAC) will also play a role in keeping the ball away from Johnson. One other special teams note. Toledo has blocked four punts and one field goal this season. Two of them were returned for touchdowns. Bull Session Trivia Answer: The legend says if the missile was ever fired, it would land 25 miles away on the 50-yard line of Bowling Green’s Doyt Perry Stadium. The Falcons are the Rockets main rival. Please join me, color analyst Scott Wilson, game host Brad Riter and postgame host Bob Gaughan for the broadcast on the Bulls Football Network. Our pregame show starts at 11:00am. You can hear it in Buffalo on ESPN 1520 and in Rochester on Fox Sports 1280. A link to the online broadcast is also available here and on the Tune In app.